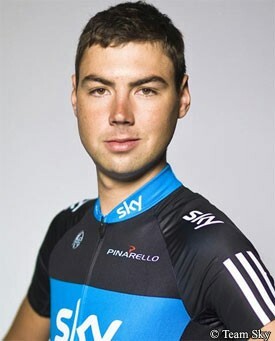 Confirmed this week as joining the new Utensilnord Named team, which is being formed out of some elements of the structure De Rosa-Flaminia, John Lee Augustyn will be one of those leaving the Sky Procycling squad at the end of the year. The 25 year old has had a difficult season due to the diagnosis of avascular necrosis, a crumbling hip complaint caused by a crash he suffered in the 2007 Tour of Portugal. Like Floyd Landis, who had the same problem in 2006, Augustyn underwent the Birmingham Hip Resurfacing in March. Since then he has been recovering and then training, and will now aim to get his career back on track in 2012 with the new squad. Unlike another departing Sky team-mate Russell Downing, Augustyn hardly raced this season. He was due to start in the Volta ao Algarve in February but his hip problem meant that he was hardly able to move. Once the operation was done, he started rebuilding again. Surprisingly, Augustyn won’t head back to South Africa until the beginning of December. He’ll remain in Europe for another month and a half, then head to the Southern hemisphere with his wife until the middle of January. He’s not sure what competitions he’ll begin with, but those details will emerge soon. “We are still working on the racing program and will soon have an idea, more or less, of what will happen,” he said.